Every piece of Designer jewelry is personal. Can you feel a person behind this one? My name is Michal Kirat. I hope that with the time you will become familiar with this name. I was born on the beautiful spring day in a small village in central Israel under the sign of Pisces. I grew up in the country surrounded by nature in all its glory – fields full of wheat, orchards blossoming, winds that can bring a heat of the deserts as well as fresh ocean air. Birds migrating from the North to the warmer lands before the winter and then passing once again in the spring on the way back. Warm waters of the Mediterranean sea and its ever-changing colors. The colors become important in my life since early childhood. Those were the colors of the blue sky, green fields and red and yellow flowers in the spring. Orange of the Sun as it is set down the horizon and of the fruits in the orchards. Aquamarine of the Mediterranean, Turquoise of the Dead Sea and unique Red which appears only for a short time in the waters of the Red Sea. Ever-changing colors of the Sea of Galilee (called in Hebrew Lake Kinneret) Colors of the winter rain clouds. There were also colors of the traditional Yemenite garments made and wearied by my grandmother. Colors of food… I grew up in the atmosphere of Israel in the 60s and 70s. It was time when different cultures brought to the country began to mix and fuse together in what was to become a source of endless creativity almost in each and every field. In my early twenties, I also went to travel the world a bit. Being born under the Pisces sign, I am always attracted to water. During my travels, I visited Atlantic, Pacific, and Indian oceans. I have also seen Titicaca and Tahoe lakes and Iguazu Falls. One of the strongest impressions was a visit to the Atitlan Lake in Guatemala. It was during the traveling that I had a first experience in creating jewelry. All the colors that I loved so much were just there – inside of the glass shards that came freshly unearthed from the archaeological sites around Israel. It was a love at first sight. It was a perfect centerpiece for the jewelry I wanted to create. I always envy those who encounter Roman glass for the first time – it is a truly unforgettable experience. Soon I had enough energy and ideas to become an independent designer. A reputation was build and my list of clients soon included the best galleries and boutiques of the country. It was just a matter of time before my designs reached US jewelry market. And now, two decades later, things never slow down. 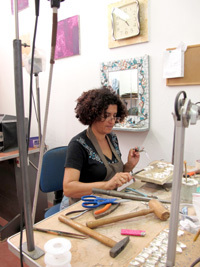 Working with the best and most respectable jewelry businesses in Israel and around the globe, I hadn’t left the designer chair or put down tools of the craft. The personal touch is important, best jewelry is always personal. Trust me when I say that if you choose to get Roman glass piece – it should be for a purpose. 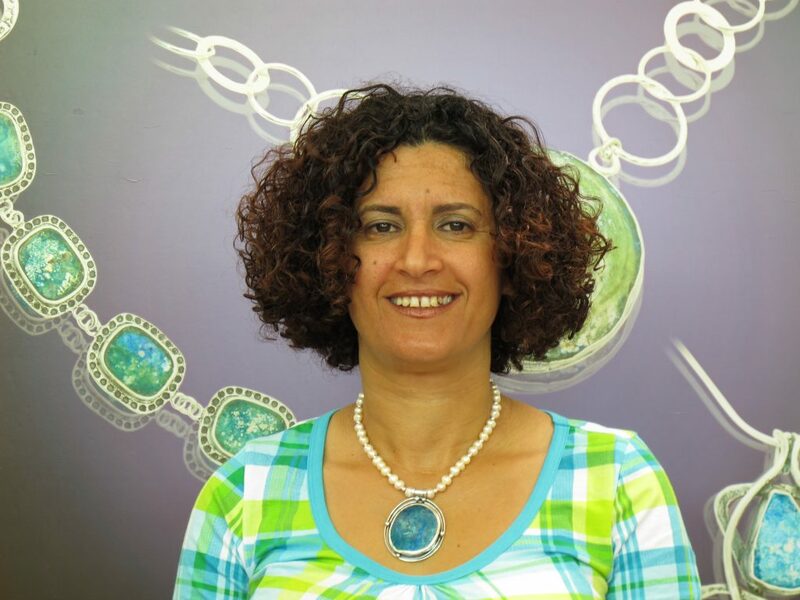 During my years of working with Roman glass, I noticed that there is an undeniable connection between Freshwater Pearls and Roman glass. The two could exist side by side on the piece of jewelry, creating a harmonious combination. Both made by water and sand…The colors complement each other so naturally and effortlessly…Many of my bestselling designs explore this direction – combining Roman glass, Freshwater Pearls and sterling silver. 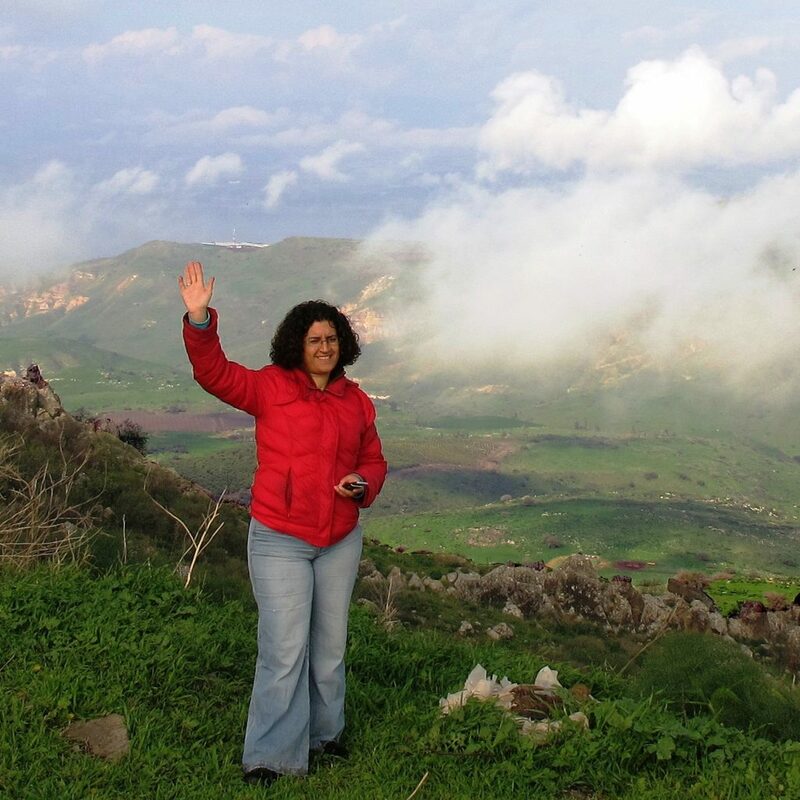 A couple of years ago, me, my husband and two daughters, left the noisy and busy center of Israeli coast and moved to the North of the country. The new home of the family and the workshop were relocated to the beautiful and pastoral Kibbutz by the Sea of Galilee. Everyone in the family and at work felt the change was for the best. Those days I take my evening walk while overlooking mountains of the Galilee and ever-changing waters of Lake Kinneret Very often the opposite shore is covered by mist and the same landscape could have quite an unpredictable look. I travel very often in the surrounding regions of the North. Trekking in the mountains and valleys always brings a new inspiration and also reveals the ancient history. I touch the ancient stones and pillars, pass by the remains of the watermills and cross the same waters that turned the grinding wheel for hundreds of years. I discover what’s left of the vineyards and olive groves treated by my far ancestors. Thousands of years ago they already grew the trees, built the houses and temples, made jewelry and fine fabrics, just as my generation does today. Israel is a small country with tremendously and uniquely varied landscapes and climates. Two hours’ drive can take you from the canyons of the desert to the river flowing through the oak forest. The most of the spectacular flowers are blooming in the winter on the background of green trees and plants. Different cultures left plenty their marks, very often on the same sites. It is always a source of inspiration and creative energy for me. I wish all of you would have a chance share my experience. I also wish you could visit Israel and discover a unique beauty of my country. I hope everyone that owns any items of my jewellery will feel the creative connection it has been designed with and will be reminded of the Sun, Spring, and the Ocean. Thank you.